Holy Salvatores and Saltzman, vamp fans, what a night! This li’l Vampire Diaries fang-natic stayed up way past her beddy-bye last night to catch the epicness that was Executive Producer/Writer, Julie Plec’s interview on the The VRO. And when I say epicness, I mean ep. ic. ness. So this morning there I was drinking my third cup of coffee in a row, squinting at the screen through sleepy lids but pumped to write this post when, wouldn’t you know it, Life popped in to unexpectedly drop an impromptu list of must-dos-right-now in my lap. But as a mom of three, I know only too well that sometimes that list just can’t wait. So I left my beloved laptop and went off to attend to matters (very broody-Stefan-like, I might add). Thankfully, just when I feared I wouldn’t get back to it today, this evening Karma interceded, sweet talking Life to put a few things on hold so I could finish what I’d started. Thank you, Karma. Once again, I owe you one. #1. Julie was ON The VRO! The fact that amidst her seriously busy schedule as Executive Producer/Writer on The Vampire Diaries, Julie took the time out to be interviewed on The VRO AND talk to fans who called in, makes her awesomely epic from where I sit. Julie even gushed in length over her love for the amazing fandom the show has. 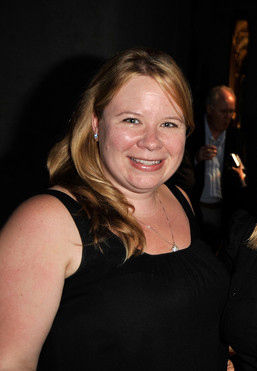 It’s official, Ms. Plec, believe it! To this listener you ARE epic, indeed. #2. Julie described my Damon as the ultimate villain with a hero inside itching to get out. It seems Damon “will always be haunted by his ‘good’ side” despite his maniacal tendencies. The fact that Julie Plec herself pretty much validated my whole Damon Defense on-air, made my night. Ah, the taste of validation is sweet; almost better than chocolate. Almost. #3 Confirmation that the werewolf arc is going to be a BIG part of their storyline. I was so excited when I heard that, I tweeted an ecstatic celebratory hoooowwwwwl!! I was a fan of werewolves for years before my fang fetish set in and I can’t wait to see where they take the mythology. #4 “Bonnie may not be the only witch in town”. Yes! This is something Vee, Lucia, Connie, Melissa and I have mused on alot. Let’s see if the writers take it where we’ve wondered it might go. #5 TVD’s Vampire Mythology. Julie answered some great questions about the show’s version of vampires including their physiology. If you’re a writer and a fan of so many things supernatural like me , you’ll especially love listening to this part. #7 Definitely more Damon and Alaric aka Team Badass adventures to come in Season 2. I for one love the way these two play off one another on-screen and can’t wait for more! Julie talks about how much the writers love to write scenes for these two and why though an unlikely pairing they may seem , it really works. Both men loved the women in their lives so profoundly and purely only to have their hearts utterly shattered and despite their attempts to resist it, they can relate to one another on this level. And now finding themselves somewhat on the same side of the impending Vengeful Vampires vs. Mystic Falls showdown, they have a common goal to protect those they care about. Makes for some seriously entertaining screen time! #8 Why they chose to change the manner of the Salvatore Brothers deaths. Julie revealed what motivated the writers to choose a completely different path in their mythology concerning the deaths of Stefan and Damon compared to the book version. I, myself, have to admit I’m still not a big fan of where they went with it in the episode “Blood Brothers”, but a fan cannot be happy with everything, I suppose. I was glad, however, to finally get some answers on the subject. #9 Fan Call-Ins! Julie was so gracious and so witty in her interactions with everyone, the fan call-ins where definitely a highlight of the show including Vee from vampire-diaries.net (and yes, I’ll admit I so fangirl-tweeted when I heard her 😉 ), Miss “Oh My Salvatore!” TVD_Chloe herself and Kissed-By Paul-at-Paley Melinda Miller. There was much fun had by all! #10 Promise of more flashbacks! And not just to the 1860’s either. Nope, we’re talking the 1960’s, 70’s, 80’s. Woohoo! A Salvatore Time Warp montage with equally epic tuneage would quite honestly rock. my. socks! So there you have it. My epic 10. The night’s musings continued well into the later hours (bless your fan-loving heart, Ms. Plec) discussing topics including why they chose “their Elena”; insights into Caroline, Matt, Tyler, Jeremy,Anna and their relationships; are Uncle John, Mayor Lockwood and Anna really dead? ; and the connections between Katherine, Isobel and Elena. Like I said: epicness. Now before I wrap things up, I have to give a BIG, BIG hats off to the ladies of The VRO who made this happen. A group of fang-tastic fans who are absolutely amazing at what they do. If you haven’t caught one of their shows before, head on over to their website and have a gander and a listen. There are interviews with more of The Vampire Diaries cast and crew including Matt Davis (Alaric), Michael Trevino (Tyler),Candice Accola (Caroline), Marcos Siega (director) and more! And for all you die-hard Team Anna fans, Malese Jow will be on tonight! All Aboard For “Camp Naughty Bad Fun”!! It’s here! It’s here! The day has arrived! “Camp Naughty Bad Fun”, my debut on TheTelevixen TVD podcast series is reaaady! So without further ado, grab your snacks and a comfy seat on the bus, and onward to “Camp Naughty Bad Fun”! !